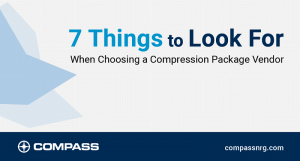 In a field as technically driven as natural gas compression, a lot is demanded of salespeople and nowhere more so than Compass. Compass account managers are mandated to do far more than respond to RFQs. According to Scott Douglas, Vice-President of Sales and Marketing, these account managers bring a level of technical expertise that ultimately delivers a superior solution. Once an RFQ is underway, account managers will work closely with applications engineering on the bid preparation, and with project management during the detailed design. Close collaboration between account managers, applications engineers and project managers – plus regular and frank communication with the client – lead to two outcomes. The client gets an even better compression solution than they originally asked for, and has a more satisfying project experience too.